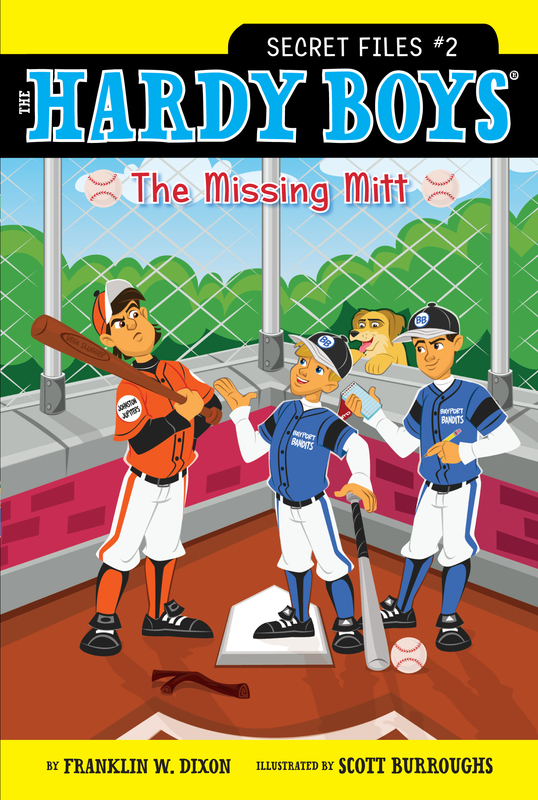 In The Missing Mitt, the boys must help their teammate find his lucky mitt before the last game, or their Little League season is doomed! The bases are loaded! Two outs, the bottom of the ninth. The Bayport Bandits really need this one to win.” The announcer’s voice was loud. This was the most exciting World Series final anyone had ever seen. The crowd went wild. They were cheering and chanting, “Hardy! Hardy! Hardy!” Eight-year-old Joe took a few practice swings. There had to be ten thousand people in the stands. Or more! He’d always dreamed of playing in the World Series. And now the Bayport Bandits had finally made it. The Johnston Jupiters were the Bandits’ biggest rivals. The crowd grew quiet as Joe got ready. He looked at his brother, crouched on third base. He gave Frank a thumbs-up. Frank was counting on him. The whole team was counting on him. Joe needed to hit this one out of the park. The pitcher threw a curveball first. Joe let it fly by. It wasn’t the right one. He’d never hit a home run off that one. “Strike!” the umpire yelled. The crowd booed. Joe held up his hand. The crowd went silent. The pitcher wound up again. This time the throw was high and inside. Joe swung, but he was too late and too low. “Strike!” the umpire yelled again. This time, no one booed. The whole stadium was waiting. Joe nodded at Frank. Frank got ready to run for home plate. The pitcher threw the ball. It was perfect! Right down the middle of the plate. Joe took a big swing. The sound of the bat hitting the ball was like thunder. Joe took off running. He didn’t even look to see where the ball had gone. He knew he’d done it. It was the home run they needed. He had won the World Series! The crowd was screaming his name. He rounded first base. His teammates were jumping up and down. He looked over his shoulder. Frank had reached home plate. Joe made it to second base. Now the crowd was screaming even louder. Joe shook his blond head of hair. The baseball diamond disappeared. He’d been daydreaming. He was sitting in the secret tree house that he and his older (by one year) brother, Frank, had helped their parents build. They were the only ones who knew about it—except for their mom and dad. He’d come up here to get his baseball gear and change into his uniform. Below, his mother was yelling his name. “I’m coming!” called Joe. He picked up his backpack. Inside were his mitt, an extra uniform, and a snack. He climbed down the ladder to where Mrs. Hardy was waiting. As if he could forget! Today was the final game of the Little League season. The Bayport Bandits hadn’t lost a game yet. But the Johnston Jupiters hadn’t either. This was going to be the hardest game they’d ever played. Joe couldn’t wait! Frank was at the kitchen table eating Rice Puffs, his favorite cereal. Spread out before him was a large piece of paper filled with names and numbers. Joe grabbed a bowl and sat down next to him. Frank spent more time practicing with his brain than with his baseball bat. Joe was the opposite. Together, they were the perfect pair. “They’re pretty good,” Frank said. “But none of them are as good as Jason Prime.” Jason Prime was the star first baseman of the Bayport Bandits. He was the best player in the entire league. His father was Willy “Winner” Prime, one of the best pitchers in major league baseball. Jason was the reason the Bandits had made it this far undefeated. But Joe and Frank were pretty good too. Joe played second base, and Frank was the team’s catcher. Joe looked up at the clock. It was eight thirty. They still had plenty of time before the game began. They didn’t even need to be at the park until nine o’clock. He poured himself a bowl of cereal. “Good morning, boys,” said Fenton Hardy as he walked into the kitchen. “Morning, Dad!” said Frank and Joe. Mr. Hardy took the clock down from the wall and unscrewed the back of it. “What are you doing?” asked Frank. Joe dropped his spoon. Frank stopped studying his paper. Their eyes grew wide. “It’s almost nine o’clock!” Frank shouted, looking at his watch. Frank’s watch could tell the time in ten different countries, and it had a compass, a calculator, and a tiny camera inside it. You never knew when those things might come in handy. “Don’t you guys need to be down at the park soon?” Mr. Hardy asked. Fenton Hardy turned around just in time to see Frank and Joe rushing out the front door of the house.